Let's face it, as founders and entrepreneurs, you have a lot on your plate—getting to your minimum viable product, developing customer interaction, hiring team members, and managing the accounts/books. Sooner or later, you have a board of directors, three to five (or even seven) Type A personalities who seek your attention and at times will tell you what to do. While you might be hesitant to form a board, establishing an objective outside group is essential for startups, especially to keep you on track, call you out when you flail, and in some cases, save you from yourself. In Startup Boards, Brad Feld—a Boulder, Colorado-based entrepreneur turned-venture capitalist—shares his experience in this area by talking about the importance of having the right board members on your team and how to manage them well. Along the way, he shares valuable insights on various aspects of the board, including how they can support you, help you understand your startup's milestones and get to them faster, and hold you accountable. 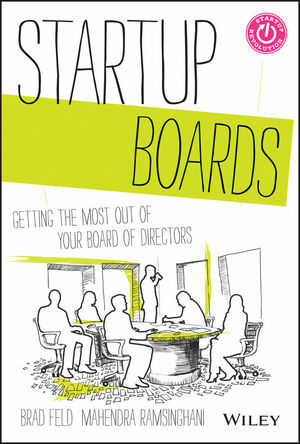 Engaging and informative, Startup Boards is a practical guide to one of the most important pieces of the startup puzzle. Brad Feld has been an early-stage investor and entrepreneur for over twenty years. Prior to cofounding Foundry Groupa Boulder, Coloradobased early-stage venture capital fund that invests in information technology companies all over the United Stateshe cofounded Mobius Venture Capital and, prior to that, founded Intensity Ventures. Feld is also a cofounder of Techstars and has been active with several nonprofit organizations. He is a nationally recognized speaker on the topics of venture capital investing and entrepreneurship. Mahendra Ramsinghani has over fifteen years of investment and entrepreneurial experience and has led investments in over fifty seed stage companies. He helped draft the underlying legislation for a fund-of-funds for the state of Michigan. For his contributions, Ramsinghani's immigration to the United States was approved under "national interest." He is the author of The Business of Venture Capital (Wiley). His articles and blogs have been published in Forbes, MIT Technology Review, Thomson Reuters, and the Huffington Post. His educational background includes a BE in electronics and MBA in finance and marketing from the University of Pune, India.